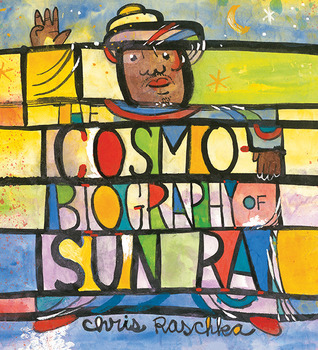 Beth - I really loved this book and how Raschka told Sun Ra's story. I featured it on the blog and included a video of Sun Ra from the 80's since I felt that readers needed to experience just a taste of this very unique musician. And wow, never thought to try working to his music. I've only heard good things about this book. Lately Raschka's illustrations have deterred me from reading his books but it seems like I'll be missing out on a great NF if I don't read this book! I just got this from the library yesterday but haven't read it yet. Looks amazing. I'll have to listen to some of the music. Thanks! I have enjoyed everything I've read of Raschka, and I can tell this would be no exception. Will need to get my hands on it! I love Raschka! And this cover looks just incredible. Excited to find and read this title. Thanks for the great info! And yes, I will want to listen to the music - would be a great idea if it came with a CD! Thank you for featuring this Beth. Like Carrie, I love Raschka's work - and how they can be uncompromisingly out there. I will look for this title, and will hope against hope that it's already available in our libraries.